Rancho Santa Margarita, CA – November 2017… Eiki International, Inc. a world leader for over 40 years in projection technology, announces the new EK-820U WUXGA (1920x1200) Laser Projector. Featuring 10,000 Lumen brightness, a 100,000:1 contrast ratio, and the superior color performance resulting from the use of both blue and red lasers, the EK-820U supports versatile LAN control and carries the added benefits of a sealed optical engine design (IP6X) that provides protection against dust without using a filter design. The result is a projector that delivers superior brightness and clarity in a cost-effective package that redefines value for professional large venue installations and rentals. Among the numerous features, the new EK-820U Laser Projector delivers stunningly vivid colors because of its use of both blue and red lasers. Compared to more traditional laser-based projection systems that incorporate a blue laser only, the addition of the red laser results in greater brightness (10,000 Lumen with a 16:10 aspect ratio), a higher red color ratio without diminishing either blue or green performance, and increased Gamut Area Ratio performance. Given that laser technology is less fragile than traditional lamp-based systems and offers nearly instant on/off performance, the capabilities of the new EK-820U make this projector an exceptional choice for applications where superior image quality is essential. The new Eiki EK-820U Laser Projector provides a wealth of connectivity options that result in greater flexibility in terms of both signal access and control. For access on a LAN (Local Area Network), these systems provide RJ-45 connectors for both HDBaseT and Ethernet. The projector also provides support for RS-232 control as well as an input for a dedicated wired IR (infrared) remote. Equally notable, the projector includes both USB Type A and B connectors—enabling it to operate over the network using a Wi-Fi dongle. Additional connectivity for the Eiki EK-820U includes both HDMI™ input and output, HD-SDI, a DVI-D connector, and VGA I/O. Of particular note, the new Eiki EK-820U Laser Projector caries an IP6X Dust Ingress Test rating. Given that many projectors are suspended, for example, from the ceiling and, as a result, are difficult to access for regular cleaning, the projector’s sealed optical engine, dust-free design ensures it will deliver exceptional performance and equally impressive long-term reliability. Its laser light source is rated for 20,000 hours. Eiki’s EK-820U Laser Projector offers horizontal / vertical lens shift and h/v keystone correction, edge blending and a powerful warping engine—thus facilitating versatile placement. There are eight optional lenses available for use with these systems, encompassing throw/width ratios from 0.36-15.24. 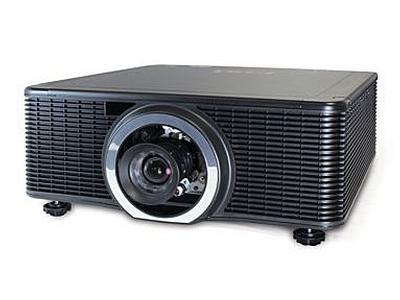 The EIKI EK-820U Laser Projector caries an MSRP of $19,995 w/o lens. The product will be available 1st week of December.